Turkey is a large country with huge variability in climate. Along Turkey's coast, the weather is influenced by the adjacent sea, with the Mediterranean Sea producing its famed hot summers and mild winters, while areas close to the Black Sea have cooler summers and less extreme ranges in temperature. Weather in Turkey's interior features a greater contrast, with hot summers and cold winters. Istanbul can be windy throughout the year. Summer is from June to September and features hot and humid weather when the temperature averages 82°F (28°C). Summers are also generally dry, but there may be rain all year round. Winters, which begin in December and end in March, are characterised by cold, wet and occasionally snowy weather, but temperatures rarely reach a freezing point. 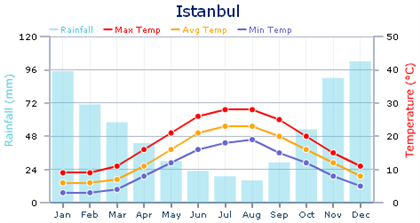 Ankara has warm and dry summers with averages of 68°F (20°C). The winters in Ankara are cold and snowy with January, the coldest month, having an average temperature of 30°F (-1°C). Ankara's rainy season is in spring and it's particularly wet during May.